I know I’ve told you all that I am not a baker. The more I think about that statement, I need to clarify. I am a LAZY baker. I do bake as I’ve shown you on this blog. I’ve shared Streusel Topped Pumpkin Bread with Apples, Blueberry and Lemon Scones, and Beer Bread to name a few, so I do bake. What I should be saying is that I only bake things that don’t involve a lot of elbow grease. I don’t do beautifully decorated cakes and cupcakes. I just don’t have the patience for all that detail work. I don’t roll out pie crust– thank goodness for my husband who makes a beautiful crust! Because of the whole rolling out thing, I don’t do traditional biscuits either. (Again, thanks to the chief biscuit maker in our house, my hubby!) However, I will do a drop biscuit. As far as I’m concerned, a drop biscuit is the best of both worlds, easy and tasty! 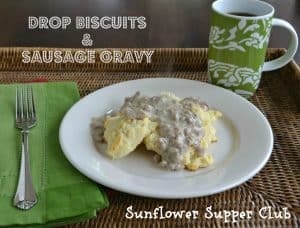 I actually prefer a drop biscuit when eating biscuits and gravy. I love the bumps and grooves that the gravy can get into. 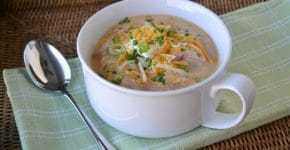 Biscuits & Gravy is a favorite of our family in the cool fall and winter months. Combine the flour, baking powder, sugar, cream of tartar and salt. Stir in the melted butter and milk until just combined. Drop by heaping tablespoons onto a lightly greased cookie sheet. Bake for 9-12 minutes until lightly browned. In a large skillet, over medium high heat, brown sausage. Turn the heat to medium and add the flour. Continue cooking for a minute. Slowly add the milk, rubbed sage, salt, pepper, and Frank's. Turn up the heat and bring to a simmer. Reduce heat and simmer for about 5 minutes until thickened. Spoon over biscuits and dig in!